This year the event comes to London, taking place at the ICC London ExCeL from 23 to 25 September (conference from 22 to 26 September) and will once again provide an unrivalled opportunity for manufacturers, suppliers and service providers of optical communications products and services to come together to meet and network with top decision-makers from across the industry. Anritsu will demonstrate a high-quality PAM4 signal simulation system on its stand at the ECOC 2013 exhibition. PAM (Pulse Amplitude Modulation) is one of the most promising techniques under development by telecoms equipment manufacturers and component suppliers as they strive to meet customers’ requirements for data rates as high as 100Gbps in the backplane and in server-to-server connections. Anritsu’s demonstration system implements PAM4 modulation in a signal simulation on the Anritsu MP1800A signal quality analyser (SQA) alongside Anritsu’s new MZ1834A PAM4 converter. Signal analysis is implemented through LeCroy’s 65GHz LabMaster Scope. Arden designs, manufactures and sells instruments and components for the optical fibre and laser industries. Products include laser beam profilers, launch condition analysers for real-time measurement of encircled flux; Modcon mode controllers for producing standardised modal launch conditions in multimode optical fibres, high magnification interferometers for optical fibre end face inspection, OTDR lead-in boxes, custom optical fibre measurement systems. Axetris will exhibit its extended range of micro optics, micro optical lenses, diffractive optical gratings as well as Infrared Sources at ECOC 2013. Axetris designs and manufactures micro-optical-lenses and lens arrays in Silicon and Fused Silica for applications ranging from UV to mid IR. It also offers custom high quality binary and multilevel diffraction gratings in a wide parameter range, while its MEMS-based Infrared (IR) sources cover the wavelength range from 2 - 14µm. Diamond will be exhibiting its harsh environment optical connectors and tools. Connectors for harsh environments must withstand particular conditions in terms of adverse temperature, shock, vibration, tensile stress, external pressure, and corrosive surroundings. These products are designed for industrial applications such as energy plants, coal mines, offshore oil platforms, cement factories, refineries, and for field-deployable communications, mobile diagnostic units, military, machine controls and industrial machine networks. Diamond’s range includes HE-2000 connector the HE-2000, the X-Beam Fusion, the OD3, Revos E-2000 and ZEUS D50 Outdoor. Representatives from Dow Corning, a global leader in silicones, silicon-based technology and innovation, and world-renown University of Cambridge, will lead a workshop on short reach (sub-meter) optical interconnect technology at ECOC 2013. The workshop, entitled Technologies for Short Reach Optical Interconnects will be held on 22 September and has been organised by Professor Richard Penty of the University of Cambridge and Terry Clapp, associate scientist at Dow Corning. This year at ECOC, EXFO will be exhibiting, among others, the FTB-1 handheld platform, which is the ultimate tool for FTTx and hybrid networks. Combining optical, Ethernet, copper, DSL and full triple-play applications, it’s designed to bring maximum automation and ease of use to end-users, enabling installation and maintenance technicians to optimise their test process and deliver flawless FTTx networks. EXFO is a leading provider of next-generation test and service assurance solutions for wireline and wireless networks. Recognized for its leading-edge portable fiber optic test equipment (FOTE) portfolio, EXFO’s solutions cover a wide range of applications, including FTTx, ADSL2+/VDSL2, Ethernet, mobile backhaul, 40G/100G, CWDM, FTTA and DAS. Among the products that FCI will be exhibiting at ECOC is the world’s first External Mini-SAS HD Active Optical Cable (AOC), which completes its extensive cabling solution portfolio for the Serial Attached SCSI (SAS) enterprise storage protocol. The External Mini-SAS HD AOC uses fibre optic cable to extend the reach of four lanes of 12Gb/s SAS up to 100m. Links of this distance make connections that are not possible with traditional copper cable, which allows for more flexible storage network installations and build out options. Storage no longer needs to be co-located with the server and could even be placed in a secure safe. Furthermore, the fibre optic cable is more flexible and narrow than copper cables, which allows for more installation options and better cooling airflow. FCI’s SAS portfolio also includes internal and external copper cables, board connectors, cages, heat syncs, light pipes, EMI gaskets, and drive connectors for 12Gb/s SAS and beyond. Finisar is the world’s largest supplier of optical communication components and subsystems. For 25 years, we have provided critical breakthroughs in optics technologies and supplied system manufacturers with the production volumes needed to meet the expanding demand for network bandwidth. Our vertically integrated business model is suited for delivering high volumes while providing access to critical technologies required to develop the next generation of products. Finisar's product portfolio includes transceivers/transponders, active cables, wavelength selective switches (WSS), ROADM line cards, optical instruments, RF-over-Fiber, amplifiers, and active and passive components. 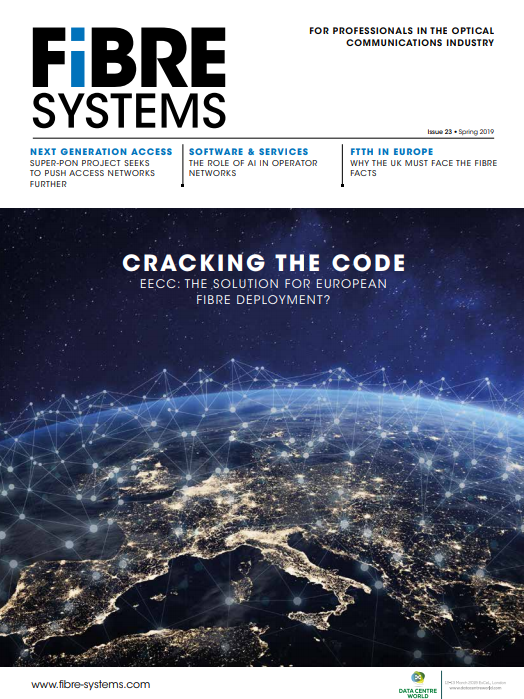 The FTTH Council Europe is an industry organisation with a mission to accelerate the availability of fibre-based, ultra-high-speed access networks to consumers and businesses. The Council promotes this technology because it will deliver a flow of new services that enhance the quality of life, contribute to a better environment and increase economic competitiveness. The FTTH Council Europe consists of more than 150 member companies. Come and meet us at ECOC in the FTTx Centre and in the Market Focus conference room at 10:50am on 23 September. Fujikura will launch two new fusion splicers at ECOC. Alongside its full range of hardware for networking the latest 19S and 19R will be exhibited for the first time. The 19S has been developed to be a lower cost alternative to the bestselling 70S fusion splicer which was launched earlier this year, featuring a shrink time of only 14 seconds. The 19R is a four-fibre ribbon fusion splicer benefiting from a new design which streamlines the steps required to complete splices, resulting in greater productivity. j-fiber GmbH is a global supplier of high-performance optical fibres, preforms, and fibre processing systems. We serve advanced LAN and data centre cabling with bend-insensitive and standard multimode fibers for serial 10 Gb/s Ethernet data transmission networks as well as for up to 100 Gb/s parallel transmission solutions. With j-BendAble OM4/OM3/OM2+/OM2 we offer a superior bend-insensitive multimode fibre that performs reliably in tight bending installations. j-BendAble fibres feature lowest attenuation loss at smallest bend-radii and minimum splice-loss. Splice tests could prove j-BendAble’s compatibility with all available 50µm BIMMF and non-BIMMF optical fibres. With OptiGrade and GigaGrade fibre product lines, j-fiber GmbH also provides the complete range of non-BIMMF 50µm and 62.5µm multimode fibres for standard compliant reliable 1….10 Gigabit Ethernet transmission. j-fiber GmbH is member of LEONI Group, a large global supplier of wires and cables and wiring systems. The latest from JDSU, which enables optical networks and 100G technology, will be on display at ECOC 2013. JDSU is introducing a second-generation CFP2 test solution that meets 100G and beyond deployment challenges with applications covering the whole 100G ecosystem from ICs testing and transponders through to 100/400G linecards and service turn-up. JDSU will provide updates on its optical spectrum analyser (OSA) for flexible-grid wavelength division multiplexor (WDM) networks and reconfigurable optical add-drop multiplexers (ROADMs) test. JDSU will also showcase updates on integrated 100G+ devices, TrueFlex portfolio adoption, twin 1x20 Wavelength Selective Switch (WSS), CFP2 LR-4 and T-SFP+, our position in Raman, and a new Twin MxN WSS for CD with software-defined capabilities for ROADMs (a single piece of hardware that now runs two applications to save costs in a network node using the same hardware as Twin WSS). Laser Components has been supplying and manufacturing photonic components for over 30 years. It will be attending ECOC 2013 and exhibiting many products, including its fibres, connectors, power monitors, hermetic feed throughs and modulators. It will also be exhibiting its Photline modulators, with information on our modulation solutions for Carrier Suppressed Single Sideband Modulation, Pulse Generation/ pulse picking and LIDAR. Its Firecomms products will be on display. Mode-Gap, the European collaborative R&D project, part of the European Commission’s 7th Framework Programme, which aims to provide Europe with a lead in the development of the next generation telecommunication networks, is to present its latest developments at this month’s ECOC event in London. Fifteen papers will be presented during the main conference session describing advances in all aspects of component and system design for few mode fibre (FMF) transmission. Polymicro Technologies, a subsidiary of Molex, invites you to test the newly developed 200/230 Optical Fiber for Data Communications and Factory Automation and Process Control. With strength well over industry standard of 150kpsi and typical attenuation of less than 6dB/km at 850nm and less than 10dB/km at 650nm, Polymicro fibre is extremely dependable even in harsh environmental conditions. It is Crimp-and-Cleave compatible and Euro RoHS compliant. NeoPhotonics is a leading designer and manufacturer of optoelectronic modules and subsystems based on photonic integrated circuits (PICs), for bandwidth-intensive, high-speed communications networks, enabling cost-effective transmission and bandwidth allocation. NeoPhotonics offers an extensive line of active and passive optical components, modules and subsystems for Line Side, Client Side and Access Networks, including: 100Gbps Integrated Coherent Receivers (ICRs), Narrow Linewidth Tunable Lasers in ITLA and micro-ITLA form factors for Coherent 100Gbps systems, 100Gbps CFP and CFP2 Client Side transponders, MEMS VOAs, SFP+ and XFP transceivers, GPON OLTs, Athermal AWGs, VMUXs, EMLs, laser drivers and modulator drivers. The Optical Internetworking Forum will host a record number of multi-vendor interoperability demonstrations at ECOC 2013. Addressing a wide range of technologies that support 100G and 400G architectures, 11 companies will verify the interoperability of their products in nine separate and diverse demonstrations. The demonstrations will illustrate the feasibility of building and implementing next-generation 100G and 400G capabilities into products today. OIF Interoperability 2013 – Enabling the Next-Generation of 100G Architectures addresses a variety of OIF supported technologies including; CEI-28G-VSR chip-to-module interfaces for CFP2 and QSFP28 pluggable module form factors, CEI-25G-LR backplane applications, module thermal specifications and SerDes interconnect solutions. Optoscribe is a manufacturer of 3D waveguide-based photonic integrated circuits. Our Optofan series of products allows robust, high-performance interconnection for applications such as spatial multiplexing by interfacing between the closely spaced cores or modes in a multi-core/multi-mode fibre and individual single cores or arrays of emitters or receivers. Wide integration options and packaging configurations are available. Optronics Technologies, of Greece, will be at booth 743 at ECOC 2013. As coordinator and partner of FP7 European projects, it will present at its booth the research activities, the main features and disseminate work progress of the Astron, www.ict-astron.eu, Fox-C (www.ict-fox-c.eu) and Coconut (www.ict.coconut.eu) projects. Phoenix Datacom will be exhibiting at ECOC and demonstrating a range of OTDRs, from rugged and smart-book modular-based OTDRs for telecom applications, to those used for applications in harsh environments, such as aerospace, maritime, oil/gas, military, rail and smart structures where distance between connectors or splices can be short, excess fibre around joints limited, and access to the link may be restricted - resulting with the need for centimetre event resolution. In addition to this, Phoenix Datacom will also be demonstrating the latest Polatis range of all-optical matrix switches which use the patented Directlight3D piezoelectric beam-steering technology to produce very low loss switch matrices, introducing no more attenuation in the optical path than a typical patch-cord. Phoenix Datacom will also be making a very exciting announcement at ECOC this year – so be sure to drop by stand 327 to find out more! Phoenix Photonics, the UK-based optical fibre components specialist, will show a new polarisation control module as part of its expanding Firebird instrumentation range at ECOC. The polarisation controller module allows predetermined polarisation states to be selected and maintained. The on-board microprocessor is programmed via a simple PC interface to provide a range of pre-selected or user defined operations. The instrument is all-fibre, providing low loss and high extinction ratio. Polatis, the provider of all-optical switch technology, has announced that it will host a live demonstration of a hybrid packet/optical circuit switched software-defined network (SDN) at ECOC 2013. It will also be launching its new Series 6000 Lite 48x48 optical switch – the first in the market to fit in just 1U of rack height with a typical optical loss of less than 1dB and better than 50dB back reflection. It is the latest addition to the DirectLight series, featuring energy efficient, low power consumption and carrier-class reliability. Tektronix is showcasing a wide-range of optical test and measurement products at ECOC 2013. The Tektronix products on display will address a wide range of applications, from multi-channel pattern generation and multi-channel BERT testing to coherent light wave signal analysis. Visitors to the Tektronix stand will be able to get hands-on demonstrations and technical advice to help them solve their individual test and measurement challenges. On hand will be the new AWG70000 series arbitrary waveform generator, which has a long waveform memory and deep dynamic range. The AWG70000 offers bandwidth on demand by generating wide bandwidth signals at baseband, IF and RF frequencies up to 20GHz. With greater than -80 dBc dynamic range and up to 16 GSamples of waveform memory, it can generate unique signals that are long enough to simulate real world environments. TeraSquare, of Korea, one of the leading companies in fabless semiconductor development, is to unveil and demonstrate at ECOC 2013 a unique parallel CDR (Clock Data Recovery) solution which will dramatically improve signal quality across 100G systems and make massive power consumption savings in the process. TeraSquare’s parallel CDR- TS-CM44013 slashes Integrated Chip (IC) power consumption to 0.75w compared to average CFP4 levels of 3.5w, does not require a clock reference and has built in JTOL testability- avoiding the current expensive requirement for external testing equipment. TeraXion will be exhibiting a new sub-band passive chromatic dispersion emulator that is now available with a broad continuous bandwidth (>400GHz) allowing DSP testing for advanced modulation formats at 100 and 400Gb/s. Perfectly suited for manufacturing environments and labs, it emulates more than 10,000 km of fibre in a compact unit while maintaining very low insertion loss. US Conec manufactures and markets MT-style and contract multi-fibre ferrules, the MTP connector family, PRIZM LightTurn lensed ferrule technology, fibre management products, dry cleaning solutions, and high-precision molded and metal components for parallel optic transceiver interfaces. UTEL has developed its Fast Light technology to allow PON system operators to monitor and test their access fibre optic systems centrally, using its advanced OTDR and software platform. The system can test and report on the status of the network and any issues such as faults or areas of concern that require attention. Simple, clear and easy to use, Fast Light will monitor system status, do routine testing for preventative maintenance and find the precise location and nature of faults. Fast light provides true management in a simple and clear manner enabling optimised resource utilisation and thus lowering operating costs.